In solidarity with our Papuan friends who have been enduring human rights abuses carried out by Indonesian security forces – intimidation, torture and killing of villagers, activists and journalists – a documentary screening and discussion will be held on 14 November, 3.00p.m. at The Annexe Gallery, Kuala Lumpur. This year marks the 41st anniversary of the Republic of Indonesia’s annexation of the province of Papua from the Dutch colonists in 1969. Since annexation, there have been various human rights abuses carried out by Indonesian security forces – intimidation, torture and killing of villagers, activists and journalists in Papua – as documented by organisations such as Human Rights Watch, Amnesty International and Jakarta-based Kontras. However, these violations have not been addressed, leaving issues such as racism and impunity unresolved even today. In solidarity with our Papuan friends, Centre for Independent Journalism is organising a documentary screening and discussion on Papua. Facilitated by Wempie Fatubun, a human rights activist and documentary filmmaker from Papua, the screening will also include two shorts made by fellow Papuan filmmakers. Wempie’s presentation is in Bahasa while the documentaries are in English. Land of the Morning Star is a documentary produced with the assistance of the Australian Broadcasting Corporation. Written and directed by Mark Worth, produced by Janet Bell, and narrated by Australian actor Rachel Griffiths. 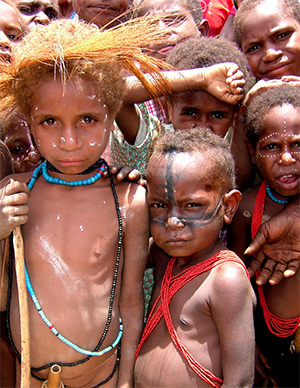 The western half of the island of New Guinea has been known by many names including Netherlands New Guinea, West Papua, Irian Jaya and Papua. It is an extraordinary place where snow-capped mountains drain into massive rivers and 250 languages are spoken. Yet, despite its wild beauty and rich culture, it remains strangely forgotten. Narrated by Rachel Griffiths, Land of the Morning Star reveals the turbulent history of a troubled country, swept up in the power play of international politics. Through eyewitness accounts and rare archival film, this fascinating documentary paints a picture that is intimate in detail but epic in scope. It is a sweeping saga of colonial ambitions, cold war sellouts and fervent nationalism, which highlights the role of players such as Australia and the UN at crucial points. By providing a background to this complex story, this timely film helps us understand the reality of life today in the land of the morning star.